Día de los Muertos: A Cultural Legacy, Past, Present and Future is part of Pacific Standard Time: LA/LA, a far-reaching and ambitious exploration of Latin American and Latino art in dialogue with Los Angeles, taking place from September 2017 through January 2018 at more than 70 cultural institutions across Southern California. Pacific Standard Time is an initiative of the Getty. The presenting sponsor is Bank of America. Exhibition co-curated by Linda Vallejo and Betty Ann Brown and the project historian Karen Mary Davalos. Programming includes weekly docent tours, educational programming, workshops and panels. Día de los Muertos (Day of the Dead) has become an entire season of celebration spanning Southern California. Beginning in August through November, festivals, pop ups, and altars are created in diverse community based organizations, public spaces, schools, and ticketed venues. Today’s interpretation of the sacred indigenous tradition has been remixed and recycled into a commercial holiday blending Mexican, Latino, and American pop culture iconography with the spiritual aesthetics of Día de los Muertos’ indigenous and Catholic influences. Self Help Graphics (SHG) presents Día de los Muertos: A Cultural Legacy, Past, Present & Future, exploring the evolution of the celebration in Los Angeles and the foundational transnational dialogue between the Chicano/Latino community and Mexico that continues to shape the tradition celebrated on both sides of the border. SHG steps away from the cultural appropriation that has repackaged this tradition to examine its Mexican roots presenting a future-focused exhibition supported by educational programming including a printed lectures, artist panel discussion, family-friendly tours, and a catalog to document this historical narrative. The curatorial team includes Lead-Curator artist Linda Vallejo and Co-Curator Dr. Betty Brown (Emeritus Professor of Art History, California State University Northridge) in partnership with SHG staff. Día de los Muertos: A Cultural Legacy, Past, Present & Future exhibition and educational programming will take place between September 17, 2017 and February 24, 2018 with the main communal celebration on Saturday, November 4, 2017. The exhibition will feature three Day of the Dead “ofrendas” by artists Ofelia Esparza (East Los Angeles), Tijuana’s Gerardo “Acamonchi” Yépiz (San Diego/Ensenada), and Marcus Kuiland-Nazario (Los Angeles) as well as select Día de los Muertos prints, photographs and ephemera from across the four-decade history of SHG’s celebration broken down into a chronological evolution including the unveiling of the 44th Annual Día de los Muertos Celebration fine art limited edition serigraph by Rosalie Lopez. Solo exhibitions of Make ‘Em All Mexican and The Brown Dot Project have been presented at Texas A&M University Reynolds Gallery (2016); UCLA Chicano Studies Research Center, Los Angeles CA, and Lancaster Museum of Art and History in Lancaster, CA (2015); Soto Clemente Velez Cultural Center, NY (2014); George Lawson Gallery and the University Art Gallery of New Mexico State University (2013) and Arte Americas in collaboration with the Fresno Art Museum, and California State University, San Bernardino, Fullerton Museum (2012). In 2016 Make ‘Em All Mexican was featured in the LA Times Calendar Section in the article “In her series ‘Make ‘Em All Mexican, artist Linda Vallejo imagines #OscarsSoBrown” by Carolina A. Miranda. Vallejo’s work is in the permanent collections of East Los Angeles College Vincent Price Museum (East Los Angeles, Calif.), The National Museum of Mexican Art (Chicago, Ill.), Carnegie Art Museum (Oxnard, Calif.), Los Angeles County Museum of Art, Print Department (Los Angeles, Calif.), California Multicultural and Ethnic Archives at University of California, Santa Barbara (Santa Barbara, Calif.), and University of California, Los Angeles’ Chicano Study Research Center (Los Angeles, Calif.). Betty Ann Brown is an art historian, critic, and curator. She has a Ph.D. in the History of Art and teaches at Cal State Northridge and Pasadena City College. Brown is trained in Ancient Latin American art history, with focus on Aztec art, and now works with contemporary art as well. Brown has curated several major exhibitions, including retrospectives for Hans Burkhardt, Roland Reiss, Linda Vallejo, June Wayne, and John White; and themed exhibitions addressing alternative families, community, and environmental issues. She is currently working on an exhibition of artist families for the Museum of Art & History in Lancaster, California. Brown has written dozens of critical essays, for Arts, Artscene, and Artweek; as well as numerous exhibition catalogues, for Don Bachardy, Rebecca Campbell, Merion Estes, Susan Feldman, Cheri Gaulke, Joanne Julian, Joan Kahn, Meg Madison, Eva Malhotra, and Kim Yasuda, among others. Día de los Muertos (Day of the Dead) has become an entire season of celebration spanning Southern California. Beginning as early as August through November, festivals, pop-ups, and altars or ofrendas are created in diverse community based organizations, public spaces, schools, and ticketed venues. Today’s interpretation of the sacred indigenous tradition has been remixed and recycled into a commercial holiday blending Mexican, Latino, and American pop culture iconography with the spiritual aesthetics of Día de los Muertos’ indigenous and Catholic influences. Día de los Muertos: A Cultural Legacy, Past, Present and Future gives context for the celebration at Self Help Graphics & Art, its origins and evolution into the iconic program we know in Los Angeles today. The catalogue includes four essays that dive into a deep history of the celebration’s roots, the innovation of Self Help Graphics & Art artists, the ongoing cultural exchange between the United States and Mexico and the importance of Self Help Graphics & Art community-based workshops and programming. 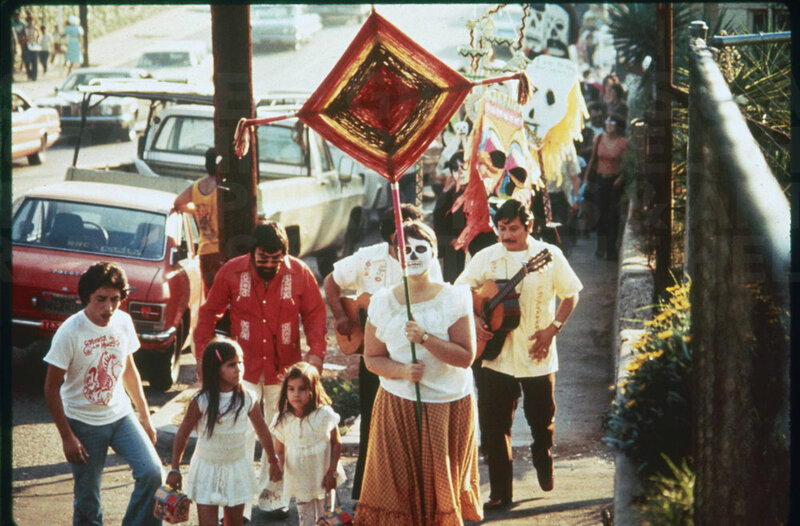 Object images include seminal Día de los Muertos prints throughout the organization’s four-decade history, photographs, and ephemera. Sign up with your email address to receive news and updates from Self Help Graphics & Art.